Tomorrow is the first day of December. My children are counting the days until their Holiday Break. Much anticipation abounds. Last day of school for the year. Christmas morning. Christmas dinner. Then, boredom hits, while stuck indoors for days because of the icy, winter weather. I remember my winter breaks. 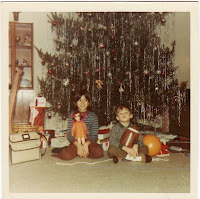 I remember having all the time in the world to play with Christmas presents - Barbie, Crissy, several arts and craft kits, model kits, etc. And, after a few days, I picked up the books that Santa Claus brought for me. A book on seashells, a book on cartooning, a children’s dictionary, a kids’ cookbook, a science book. I still have several of those books I received for Christmas. They just seemed a little extra special to me. What special books did you get for Christmas or Hanukkah? Did you study each page of the book? Did you learn something new or find a new passion? The power of a fabulous nonfiction book combined with the freedom of all the time in the world to read and digest each page is priceless. We, as parents, have a sense what our children will enjoy to read. The trick is to introduce our children to the world and the cache of amazing information available - and open their eyes and their hearts. The gift of a great nonfiction book is something that they can carry with them forever, figuratively and literally. Gift to keep forever. Perfect for any to-be nonfiction writer. One of several kid versions of Gray's Anatomy. What child wouldn't be interested in rocks? The classic cookbook that can be used forever. Perfect activity to keep kids busy and creative. Had to add a classic art reference book. Not just for budding artists, every child needs art! Until next year, Happy Holidays, everyone! I had a big essay for today but it seemed like overstuffing the turkey. I'm imagining we're all just creeping back to work. So, I'm going minimal and bloggish with what I'm thinking, via linking. Here is much of what I what I was going to say. Consider it a peek at what a nf writer outlines before they, um . . . write! OUTDOORS. PLAY. PIE. Need I say more? When you read this, I will be in Africa, giving author talks at international schools in Mali, Burkina Faso, and Senegal. Before I leave for any new destination, I search out books to read, and this time I found three terrific ones. 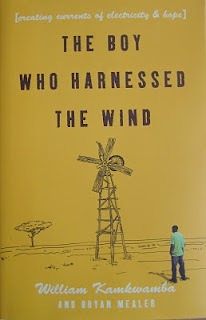 The Boy Who Harnessed the Wind: Creating Currents of Electricity and Hope by William Kamkwamba and Bryan Nealer (William Morrow, 2009) offers a personal story that reflects the previous book. With his native Malawi suffering a horrific drought/famine (and the government not releasing surplus food,) Kamkwamba’s family can’t pay his school fees and so he drops out. He picks up an old science book in the library, scavenges an abandoned factory site for scrap metal, and constructs a wind turbine that gives his family electricity. 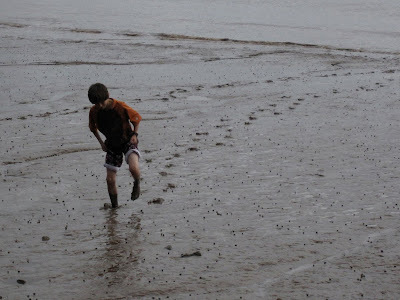 We read a boy’s account of rural village agricultural life in the best and worst of times. This is a perfect story for privileged children – indeed adults, too - to read. Happy ending (so far:) William flew to the US to speak at a TED conference, and is now studying at a gifted school in South Africa. by Baba Wagué Diakité (Groundwood/House of Anansi, 2010) Following an old tradition in Mali, at age four Baba Wagué was sent from his home in the city to live with his paternal grandparents in a rural village. He stayed for ten years, during which time his father died and he rarely saw his mother. Diakité, an author-illustrator of African folk tales, traces his storytelling career to his grandmother and life with his large extended family. We learn a bit of French colonial history – his grandfather was arrested but later became the village liaison to the French. We read some of grandmother’s folktales. We see the strict respect children show to their elders. All is not rosy. It took Diakité some time to adapt to life without his mother. A young cousin died in his arms during the drought/famine of the 1970s. Later he begged to go to school, but his grandmother refused. “You will go to school when you are educated,” she replied. Finally, he returned to his mother in the city, but almost doesn’t go to school for, while she has just enough money to pay his school fees, she doesn’t have enough to bribe the principal to admit him. He finally enters school, and honors his grandmother by becoming a storyteller. Today, Diakité lives in Portland, Oregon with his American family. He also runs an arts and cultural center in Bamako, Mali. These three books give a glimpse of African history, politics, biography, and folklore and create a cultural context with a human face. 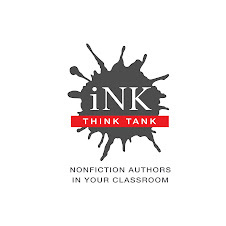 As you can tell by reading Tanya’s post, she and the other INK THINK TANK ERS are all hard at work trying to spread the word that nonfiction books should be an essential teaching tool to transform teaching within the curriculum. So while they tackle that behemoth, I’d like to point out that there are other ways that nonfiction can be useful. 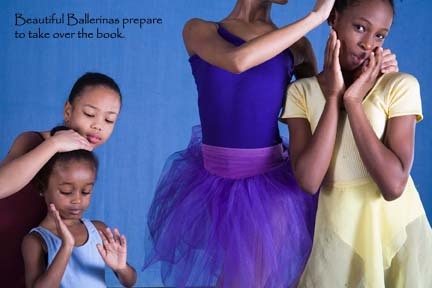 Truth is, non fiction been shown to be highly effective in giving children something to read that they find interesting. Kids can actually learn about something that is not a subject they are required to study in school. Yep, nonfiction just for the fun of it: imagine. Below is a list of some nonfiction books I have read to a variety of elementary school classes. These had nothing to do with what we were studying on a given day. Some are historical; several of them mention underwear (a fabulous extra bonus). I read them as an extra treat, just for pure reading enjoyment. And the kids loved them. You can even try this at home. I can think of lots more. I'm sure others can too. If anyone would like more suggestions, just let us know. These are preholiday odds and ends musings, inspired by several posts on I.N.K. and e mails back and forth between many of us. Regarding two separate recent articles, one from the NYT declaring parents’ lack of interest in buying picture books for their little ones, whom they prefer to read chapter books at age five, and the other article declaring that nonfiction bores children, I decided to call Melissa Posten, the children’s book buyer(and, in my opinion, an expert) at Pudd’nhead Books, one of St. Louis’ few independent bookstores. She said, “Anyone who thinks children don't read nonfiction or picture books are dead hasn't shopped in a brick and mortar bookstore recently. 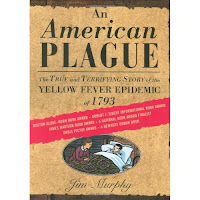 Great nonfiction and great picture books are timeless, and the good ones get better every year. When I was little, nonfiction consisted of stale biographies and books about space with black and white pictures. Now there are nonfiction picture books about everything and everyone you can think of, from Sonia Sotomayor to William Shakespeare, from Foucault's pendulum to scuba diving. 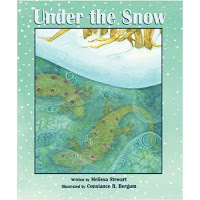 This is the golden age of picture book nonfiction, and we are lucky to be alive in it.” Well said, Melissa!!! Strange that mothers don’t want to buy chapter books in lieu of picture books when according to another article in the NYT a week ago, and I quote, “Mothers want preschool television to be more about teaching social skills and less about pushing clear academic goals –at least that’s what Disney executives say new internal research indicates.” Gosh, the NYT should make up it’s mind! No, i am not refering to MJ's son i am talking about Andy Warhol! ( yes he gets an exclamation point)I have been so intrested in him ever since i started reading "Andy Warhol,prince of pop" written by Jan Greenberg and Sandra Jordan. I found out so much that was surprising to me like the fact that he was a very devout catholic and that he almost died when he was young. Anyways that book is good and it got me into thinking about how great of an influence he was to music like "femme fatale" by Velvet Underground( which is one of my favourite songs) that wouldnt have happened if it wasn't for him and of course the banana on thebands famed t - shirt ofcourse he did more than just paint pretty pictures what was great about him was what he said and how he did everything he did always not caring for what people said he dabbled alil bit in anything which back than was'nt so common as today and that what made him avant-garde. And this from the artist Timothy Archibald. New work from photographer Timothy Archibald as well as the work of other folks he really digs. So good…I’m glad somebody out there’s not bored with nonfiction. Thank you. On another note, I’m enjoying Melissa Stewart’s posts about lyrical language and sensory images. I think one of the most beautiful passages in the English language is the last paragraph of The Dead from James Joyce’s Dubliners. Although this is fiction and geared toward adults, these lines are among those that writers of any genre can emulate. The flow of language takes my breath away. A rumination on snow in Ireland (and much more). In closing and wishing everyone a very Happy Thanksgiving, I would like to share my famous spinach casserole recipe, served every Thanksgiving in my family for forty-five years….old-fashioned, thousands of calories, and absolutely delicious!!! Mix altogether and cook at 425 degrees unto light brown and bubbly. She was talking about the state of textbooks, as well as the lack of integration of standard curriculum with the stories of science and social studies that, without, leave gaping holes in education. That’s where we nonfiction writers today come in. As depressing and infuriating as much of Hakim’s article was to me, I also felt myself saying “but we do that—those stories are being written!” And so, with the intention of offering a tiny bit of assistance to all those who teach and/or otherwise influence the education of young minds, I decided to begin compiling a recommended reading list of stories for older readers—true stories; i.e., nonfiction (or veritas, truthiness or True Dat! )—that will surely supplement and complement and enhance the experience of anyone taking social studies and science classes using textbooks. Please—I mean this—please, add to this beginning of a list. Let’s make it grow. I will incorporate your comments and update the list accordingly. Next time, I’ll make a picture book list! Cobb, Vicki. What's the Big Idea? : Amazing Science Questions for the Curious Kid. List #2 seems more aligned with David Macaulay’s body of work to me, thought of course his work is very visual. In case you haven’t recognized them yet, these are right-brain (#1) and left-brain (#2) characteristics. Do right-brain people prefer fiction? Do left-brain people prefer nonfiction? The specifics of right brain vs. left brain preferences are not as cut and dry as popular accounts might lead one to believe... people use both sides of their brains (hopefully) and there is quite a bit of overlapping functionality. While I don’t want to overstate the significance of how our brains work, most of us know which side we naturally favor, don’t we? Are there more right-brainers in certain fields that impact children’s books? One example: people who enjoy math are usually left-brained and when I ask audiences of elementary teachers to raise their hands if they love math, not many hands go up! In that vein, here is an interesting article about right-brained, left-brained, and “middle-brained” teachers and students. In any case, if this theory has any validity what should we do about it? Hmmm... should I make a list or start doodling? This is from his Paris Review Interview Spring 2010 that I wrote about last month. Think how much you know about that breakfast. I love it. And I also love the implicit question: what should we call this type of writing? Considering how much time we put into working on it, thinking about it, crafting it, caring about it, it’s just insulting that it should be NOT something. I posted the question on Facebook (Friend me; I have a literary salon going—I make a comment, leave to write or research for a day and come back to long conversations going on without me). Carol Rasco said she always found it confusing as a child—why was it NON something. Hard to think of something as a negative. And Deborah Kops pointed out that a new term for all kinds of nonfiction seems to be Biography. The point I want to make is not only that it would be nice to have a better word for what we are doing, but also that we think so much about what we are doing. To that end I want to tell you about an interesting event I went to the other night at the Columbia Journalism school: “The Science of Storytelling” Dean Nicholas Lemann in conversation with Pulitzer Prize winner Prof. Jonathan Weiner: "A discussion of the practices and pitfalls, techniques and triumphs of long-form science writing." Nick started the session by saying that nonfiction writers seem to fall into two camps: You come up with the story first and then as you are researching and writing find the larger theme; or You start with the theme and then find the story. (See Barb Kerley’s post of last week). He asked Jon which camp he fell into or did he fall somewhere in between. Jon falls in between, and it also changes from book to book, but he usually is already interested in a theme—he follows so many of them—and then looks for a constellation of components: character; drama; scene. He doesn’t want just talking heads. He wants to write what you can call a nonfiction novel about science. Nick, who writes about mainly politics, talked about how when you talk to politicians it is hard to get beyond their canned quotes, beyond the message they want to put forth. It’s the same for those of us who write nonfiction for kids: we don’t want to just spew out the same old stories, the same facts that are in textbooks. We want to get beyond the canned stuff and write groundbreaking and original books. 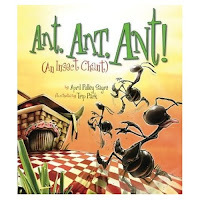 If you look at the nonfiction that has been published for kids in the past few years you will see exactly what I mean. But he says that his structure is almost never this happened and then that happened. He wants to weave a narrative, and have a structure that fits with the theme of the book. Sometimes, as is this book, his structure is a little surprising. I think we in kidlit and especially in picture books can play around with surprising structure--as long as we don't get too complicated. Nick pointed out that forms exist for a reason and that sometimes you can take a form and make it seem new, and so form is more your friend than your enemy. That is true, too. I think we come at it from both directions. Innovation and experience and back again. A couple of years ago in a post Marc (Nonfiction Guru) Aronson suggested Knowledge. I still don't have a favorite. At the moment I finish this piece I'm leaning toward Truedat. Or Granola. 1815: A momentous year it was, beginning with British commanders sending attack after attack at the American fortifications and entrenchments surrounding New Orleans only to surrender the field to General Andy Jackson, tough as hickory. Many a year later Jimmy Driftwood, a folk singing high school teacher, who wanted to fire his students interest in tedious American history (what a concept!) wrote a song in which he described the battle. The chorus of it went like this: “We fired our guns and the British kept a'comin./There wasn't nigh as many as there was a while ago…” http://www.youtube.com/watch?v=LsRK3DNoa_Q How my 8-year-old self loved that song! Not two months later, Napoleon Bonaparte escaped from exile on the isle of Elba and led a march to Paris, to a few more months of glory, before he met his undoing in Belgium, at Waterloo, to be more specific. Meanwhile, in the spring, dashing Commodore Stephen Decatur had sailed out of New York harbor with a squadron of 10 ships bound for the successful clashing with the pirates of the Barbary Coast, who’d been bedeviling navigation on the Mediterranean Sea. Despite the fact that the U.S. President, James Madison, and Dolley, his vivid, hospitable First Lady, had been burnt out of their official manse on Pennsylvania Avenue, this was a heady time for the young United States of America. Charles Dickens turned three in 1815 and John Adams celebrated his 80th. His 'dearest friend,' who once beseeched him to 'remember the ladies,' was 71 now. Away out on the frontier, Abraham Lincoln was a shirt-tailed 6-year-old. In the fall, when the weather had turned cold up in New York State, Daniel and Margaret Cady welcomed their 8th child into the world on November 12, 1815. As anyone knows, if she’s been alive longer than a decade or so and has been blessed with as many brains with which God endowed a cuckoo clock, life is not fair and it'd be particularly unfair for baby Elizabeth Cady because her soul, her divine spark, all of her energies and intelligence came packaged in the body of a girl. If you’re reading this or if you’ve read Tanya Lee Stone’s fine Elizabeth Leads the Way: Elizabeth Cady Stanton and the Right to Vote or seen Ken Burns’ excellent documentary, Not For Ourselves Alone, http://www.pbs.org/stantonanthony/ then you know that E.C.S. and S.B.A. spent the next 50 years forging and firing the thunderbolts, speaking, lobbying, organizing, working for civil equality and the vote. “The right is ours,” wrote Mrs. Stanton. “Have it we must. Use it we will.” (This last was optimistic.) Neither of them lived to cast a law-sanctioned ballot, but they knew full well that, as the saying went, they were sowing winter wheat, as mindful as the nation’s founders had been, of posterity, of girls yet unborn. In her later years, Elizabeth Cady Stanton looked more like a tea cozy than a radical, but a radical thinker she was, the woman that was born 195 years ago this month. Beneath her snowy curls her tough brain crackled to the end. I recently participated at a media specialist conference in Florida, where I heard a number of interesting presentations by our fiction writing colleagues. Gayle Forman when she writes she hears the voices of her characters. We nonfiction authors do that, too, of course, but there’s an additional step. First, we must search out real characters, alive or dead, and then find ways to integrate them into our heads. At least that’s my process. Nonfiction writers’ search for characters is indeed a long, twisty road. This subject led me to the master of all character searches, Luigi Pirandello, who I assume reads INK somewhere in the Italian grand beyond. I ask him: Caro Senore Pirandello. Per favore. Your Six Characters in Search of an Author is great theater, but how about some help for us nonfiction writers? After all, we share much in common. Just as your characters take control of your play, people represented in nonfiction literature usually take control of the books right from the start. Primary sources are our bread and butter. For this writer, my primary sources, my people, ARE the book. The way I work is somewhat logical and somewhat not. Before I meet anyone, I need to understand my subject – just enough to be able to ask decent questions – but not so much as to enable preconceived ideas to drive the book. That’s the characters’ domain. Meanwhile the networking in search of said characters begins. To network, timidity has no place in the lexicon of nonfiction. We must be tough, just like your pushy six characters, Senore. I’ll call anyone I know who might know someone who might know someone. Emails go out to suggested organizations, and to the friends of friends of friends. Fingers crossed, I await the responses. In the best of all worlds, doors fly open, private intimate materials are gingerly handed over, and the most fascinating, introspective, articulate people whoever walked the planet start talking. Oh-oh, now I’m verging into fiction. Truth-be-told, this doesn’t happen quite so quickly, but hey, this is a blog, and our readers are busy people. While the hopefully discovered most fascinating person talks, I tape, listen, and watch. Does she lean to the left? To the right? Does his upper lip curl when revealing an inner truth? Is she a blinker? When does he laugh nervously? Also: Am I pushing too hard? Not enough? Asking the right follow ups? This is a balancing act whose high wire is based on trust. It’s extraordinarily exhilarating – when it works. It’s not just the nonfiction writers who do this. Fiction writers have their own mishegas. [Yiddish for the above paragraph.] Before my friend, Elizabeth Levy, wrote Tackling Dad, she needed to feel football. 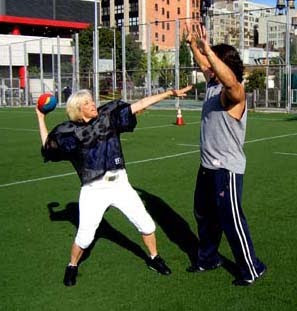 So she went out and bought her own gear and hired a professional football player to teach her how to feel the sport. "Tackle me but don't kill me, please," she told him. By now, I’m so totally in love with my characters. Friends and loved ones say I need to step back. “Remember,” my husband often admonished while I was writing No Choirboy: Murder, Violence, and Teenagers on Death Row, “he was convicted of murder.” But we writers need to understand the good in the bad, and the bad in the good, to reveal the full panoply of the human condition. We search for our characters … and fall in love. Which Story Do You Want To Tell? The class was held over four days: an intro the first evening, two full days of awesomeness, and then a wrap-up the final morning. One of the great things about it was this relaxed structure. Over the course of the class, I had four scheduled one-on-ones with a really smart editor whose sole focus for that half hour was to help me make my work better. But equally helpful was the fact that in-between each meeting there was down time when I could process what we’d talked about, let the cream rise to the top, and generate new ideas to discuss at the next meeting. Roxburgh’s goal is to help you tell the story you want to tell. Sounds simple, right? But I’ve been surprised by how often authors I know (myself included!) struggle to articulate exactly what they are trying to say in the book they are working on. You’d think we would know what our book is about since we are writing the darn thing. But but but sheesh, when working in a field that offers almost limitless possibilities, it can be hard to choose: which story do I want to tell? Though I worked on a novel during the class, it’s the same issue I face when writing a work of narrative nonfiction. After months of research, there is a LOT of information rattling around in my mind. I can’t really know what to keep and what to get rid of until I decide what my story is about. This was a particular challenge when I worked on The Extraordinary Mark Twain (According to Susy). I was juggling three elements: the extraordinary—in every sense of the word—Twain and his quirky genius; his equally extraordinary daughter Susy—deeply perceptive to her father’s strengths and weaknesses; and the no-holds-barred biography she wrote of him in secret. For months I researched, feeling alternately hopeful, excited, and frustrated. I knew there was a story there, but for the longest time, I couldn’t quite grasp it. And because I couldn’t quite decide which story I wanted to write (there were so many to choose from! ), I couldn’t really start writing. Luckily, I have an amazing editor, Tracy Mack, who knows this about me, and one of the many wonderful things she does is help me succinctly articulate what my story is about, so that I can then actually write it. Deciding which story you want to write is the first step. Next month, I’ll post some thoughts on what to do after you’ve got that first, oh-so-messy draft down. Last month I wrote a post about lyrical language and many of you had great comments. Thanks so much! Jan Greenberg mentioned the role of sensory words in creating lyrical prose, and I couldn’t agree more. In fact, for today’s post, I’ve decided to highlight some of my favorite examples of writing that is enriched by sensory details. Sensory details can really bring a piece of prose to life. Why is appealing to the five senses so powerful? Because they are how we experience and interpret the real, 3-D word we encounter every day. Sights, sounds, and especially smells can instantly transport our minds to a specific time and place, an event from 10, 20, 30 or more years ago. They can also transport us to a time and place described in a book. Consider the following examples. Two are from adult books and one is from a book written by one of my fellow I.N.K. bloggers. Chew-chew-chew an antbird calls. Shapes flit. A grasshopper thumps onto a trunk. Thwap, pip, pop. Insects leap up, jump up, fly up! Frogs are hopping. Tarantulas are scurrying. The army ants are waking. . .
And they’re coming right this way! See how the sensory details in these pieces allow you to draw on your past experiences of the world, and in so doing, help take you to the place the author is describing? Appealing to the senses can be very powerful. Can you think of other books that make good use of sensory details? A while back I was asked to be a judge for the NSK Neustadt Prize for Children's Literature. The award is presented every other year for "significant achievement" in children's books and is sponsored by World Literature Today and the University of Oklahoma. And aside from a nifty silver medallion, the recipient also gets a very hefty check for $25,000. That certainly got my attention. At first I was going to turn down the request. I was already a judge for another book award, had several articles to deliver, and, oh, yeah, I was trying to write a book or two. Then I looked at the list of past nominees. Of the previous 26, only a small handful were dedicated writers of nonfiction. The number was a little disappointing, of course, and I'm sure I scowled. That's when I noticed something else. No one had ever put forward David Macaulay for the award! Now that I couldn't believe. 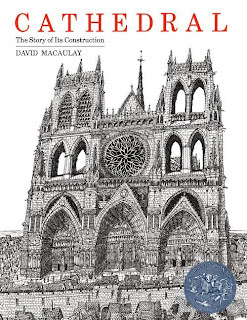 I remember the impact Macaulay's first book, Cathedral, had back when it was published in 1973. It was such a dazzling departure from what had been done in the past that it changed the world of children's books forever and even (in my opinion anyway) influenced the way picture books are created (think Chris Van Allsburg; think Mordicai Gerstein's The Man Who Walked Between the Towers). And he followed this first book with a long list of other amazing, humorous, and informative titles that earned him one award after another. Step 1 as a judge was to write a piece explaining why our nominees deserved the award. Mine was six pages long, a passionate and detailed look at his books and the impact they had (and if anyone would like to read it I'd be happy to e-mail it to you). For step 2, we had to choose a representative book of the individual's work. I chose Mosque, not only because it is a clear and beautiful description of the construction and many uses of a mosque, but also because it was published after 9/11, which I felt made a brave and needed statement about a misunderstood and often maligned religion (and a glance at recent headlines suggests it's just as relevant today). The written pieces and books were then shared among all eight judges. When I and the other judges met later via a phone conference, we began by making an oral presentation of our candidates. Before the actual voting there was a brief period of time to make additional comments. Here's where things got a bit sticky. After a few minutes of amiable small talk, a soft, hesitant voice said, "I'm not sure how anyone else feels, but I responded the least to the David Macaulay book...." She said more, but what I heard instead were several other judges making sounds of agreement. Yes, I did rush to defend Macaulay's work, but it was clear he stood no chance. Don't get me wrong. All of the judges were thoughtful, extremely intelligent and articulate, and caring people who clearly loved children's literature. And every author nominated deserved to win. I know several of them and secretly hoped they would take the award if Macaulay didn't. What hurt was that the non(ie., not)fiction book was probably toast before the race actually began (even though I'd still argue that Macaulay's contribution to children's literature has been monumental). The emotional impact of fiction is immediate and visceral, and moves readers in a profound way (which is as it should be). Nonfiction is in many ways more complex and subtle, and, I could argue, it's more difficult to achieve that ground-shaking emotional response. 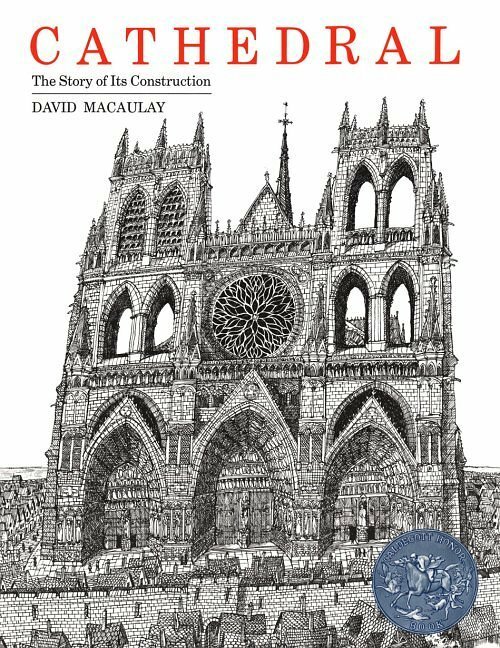 Not only does Macaulay have to have absolutely accurate information, but he has to integrate it seamlessly into the story of the mosque's construction, and provide stunningly dramatic and accurate illustrations. He does this so effortlessly that I think his artistic achievement is often overlooked. That has been the general fate of nonfiction, I'm afraid. But I came away from my NSK Neustadt experience with a new resolve: to emphasize whenever and wherever possible the passion and artistry that goes into all of our nonfiction work. It's one of the reasons I'm so happy to be a part of INK and INK Think Tank. But I think I (we?) need to do even more, to widen my field of vision and be more agressive in pushing forward nonfiction as a unique artform. It's why I take time every day to read other blogs and to respond when appropriate (and even recommend and advocate for other people's books). It's why I'll soon be taking tentative steps into FaceBook and Twitter land and any other social media that can get our message out. Not that this is a new or revolutionary idea (after all, you have been doing this here at INK for a long time). But every so often a little shock makes me realize the need to tell the world exactly what we do and how hard it really is. In time, maybe the message will sink in. Any thoughtful writer has different reasons for writing her stable of books, ranging from a story that must be told to commerce, plain and simple. In a reflective moment, I realized that many of my books are the ones inspired by the child I once was or the adult I’ve become with important things to impart. Examples from the kid end? I wrote the Brave Kid series for my younger self, stories in which ordinary children show courage in hard times. I found kids who lived in different eras to bring in another element. But my real message was that you don’t have be an expert in the martial arts to be a hero. Being scared and acting anyway is heroic. Standing up against something wrong, even just a little bit, is heroic. Getting through something really hard is heroic. Way back then, I wish I had known that we don’t have to measure ourselves against an ideal or end goal to be brave. Trying is brave. I made sure to reveal some foibles of Washington, Jefferson and Adams in See How They Run: Campaign Dreams, Election Schemes and the Race to the White House for the same reason. In the service of giving kids a moral lesson, we used to paint these guys as gods (okay, not Adams, no one ever seemed to like him much but Abigail). But we robbed kids of the chance to see that imperfect people struggling to do right is perfectly heroic. Last thought. Many of my books, serious or funny, have an uber-message the adult me wants kids to know. It boils down to: Hey Kid, you think that the world you see, hear, touch is THE world. Well, it’s just one part of it. Your truth is a truth; but there are others too. Check it out! Authors out there, I’m curious. What are some of the deeper reasons behind your books? Is there a pattern? Some message important to you that you keep trying to get across? Wouldn’t it be great if the Democrats and Republicans in Washington, D.C., could work together as well as the various athletes on the San Francisco Giants? When the Giants won the World Series earlier this week, it was a classic example of the whole being greater than the sum of its parts. Every player contributed to the team’s overall performance and the result was a victory that few sports pundits predicted at the beginning of the baseball season. Teamwork won out over the glorification of individual players and prima donnas. I love it when a sports concept pops up in everyday life, and teamwork and collaboration have been doing just that lately. In his post-election press conference on Wednesday, President Obama spoke extensively about the need for elected officials to join efforts across the aisle. And at the 2010 Long Island Technology Summit that I attended last week, Dr. Tony Wagner, the keynote speaker, listed collaboration as one of the seven survival skills students need for careers, college, and citizenship. Wagner, founder and co-director of the Change Leadership Group at the Harvard Graduate School of Education, is the author of The Global Achievement Gap: Why Even Our Best Schools Don’t Teach the New Survival Skills Our Children Need—and What We Can Do About It. He believes that the consumer-driven economy of the 20th century has given way to an innovation-based economy, and our education system has to change to produce people who can compete in this new world. Besides collaboration, the skills he sees as being essential are critical thinking and problem solving; agility and adaptability; initiative and entrepreneurialism; effective oral and written communication; accessing and analyzing information; and curiosity and imagination. In other words, it’s not facts and information that should be at the heart of learning in the new millennium. While it’s useful to have total recall of factual information, those who don’t can access facts easily at any time on any computer or smart phone. It’s knowing how to formulate a search and knowing what to do with information that is crucial. And the ability to work together, to share skills and ideas and conclusions, is the key to success. Anyone who’s ever written a book or worked on a magazine has experienced that. No matter how brilliant a writer is, she needs an equally brilliant editor and graphic designer, as well as numerous other folks, to bring a work to publication. When I write a book, I also do the photo research, but no matter how hard I try to picture the interplay of my words and the images I provide, my book’s designer always surprises me with a different—and better—way of presenting the material. Much as I hate to admit it, I just don’t have the “designer gene.” But I definitely can appreciate good design when I see it. Teamwork is as crucial in the publishing world as it is in sports. Besides encouraging collaboration with people who have complementary skills sets, it allows us to share both the pressure and the payoff. Just like the San Francisco Giants. And the New Orleans Saints. And the Seattle Storm, 2010 champions of the WNBA. How does teamwork enable you to succeed at your job? 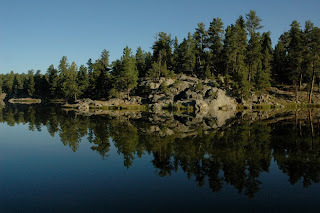 Last year, with my wife and co-author Robin Page, I packed camping gear, computers, cameras, drawing pads, books, and lots of trail mix in a VW camper. 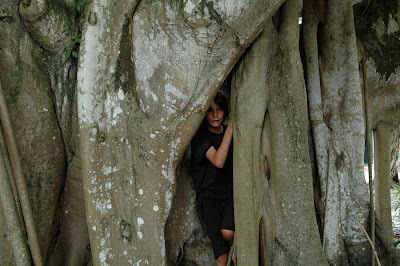 We took our 11-year-old son out of school and set off on a long-planned 12 months of travel (‘sabbatical’ sounds so much more professional than ‘year-long road trip’). The plan was to explore the U.S. and Canada for six months, then visit a few other parts of the world in the second part of the trip. We would home school Jamie. And think, talk,and write about children’s books. We spent almost six months on the road, driving more than 20,000 miles (I try not to contemplate that carbon footprint) and listening to something like 700 hours of audio books. We cut our trip short due to parental health issues — such is life. Still, the trip was an amazing experience. 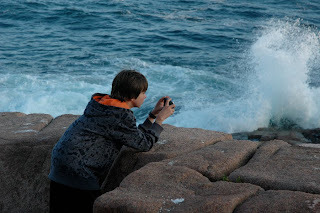 The best part was being able to spend so much time with a curious, engaged, but almost-teenage child who would normally be preoccupied with school, friends, and soccer, just as Robin and I would normally be preoccupied with work, housekeeping, etc. By design, we explored both cities and wilderness (at least what’s left of it). In college, I had a design professor who was my first — and best — mentor. I worked for his urban planning firm full-time in the summers and part-time during the school year. Much of the work involved figuring out the best places for homes, parks, paths, and roads on land that was to be developed. I remember him telling me that the most interesting spaces were at the edges — the place where a meadow meets a wood, or where flat land meets a hill. Often, these are the places where one finds the most diverse flora and fauna, and where the landscape possesses a certain kind of energy (I know this last bit has a new-age ring to it — something I wouldn’t normally indulge in — but it’s appropriate in this case). In retrospect, we gravitated toward interfaces — edges — as we traveled. Not necessarily consciously, but unmistakably. We had the luxury of having no real itinerary, so we could stay in a place as long as we found it intriguing and leave when we stopped being interested. When we found ourselves in homogeneous environments, whether geological, ethnic, political, or some other flavor of vanilla, we usually moved on quickly. The cities we found most vital — Seattle, Vancouver, Montreal, New York, Miami, New Orleans — are cities in which distinctly different cultures collide and interact. The most fascinating natural environments — the coast of British Columbia; Mount Rainier, where an alpine volcano emerges from a temperate rain forest; the intersection of the Rocky Mountains and the Great Plains (I live in one of these places, and can walk from 300-million-year-old horizontal sea floor sediments to the upthrust basalt of the Rockies, 230 million years younger, in five minutes); the coasts of Nova Scotia and Maine; the mountains and desert of Big Bend National Park — all feature the dramatic juxtaposition of very different physical environments. This is the place in my narrative where I take a leap. But that’s what’s great about blogs — they can be places to test an idea, to think out loud. 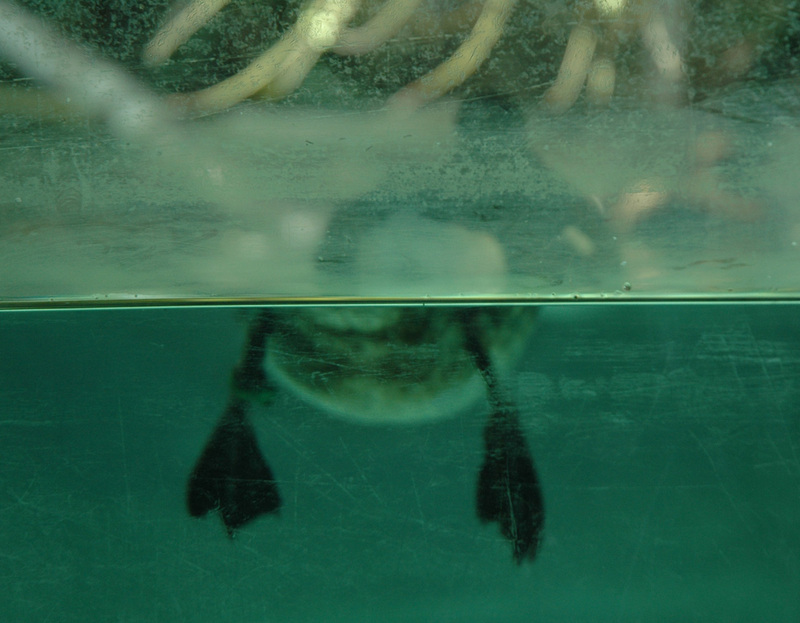 The consequences of leaping into empty space aren’t as dire as in the world of ink-on-paper. Somehow, this idea of edges feels like a metaphor applicable to children’s non-fiction books (I say “books” rather than “writing” because I’m thinking of the visual as well as the verbal). Scientific or historical information presented in a homogeneous way — as a encyclopedic collection of facts and data, or a linear chronological narrative — is invariably monotonous and boring. When information is presented at the interface of two or more ways of thinking or seeing, things get interesting. (History at the intersection of science, sociology, journalism, and personal memoir, among other things).